Hello eSewa Users, Do you know you can access your eSewa account using SMS. You can perform all general payment process through sms. Today we will guide to use eSewa over SMS and here you will get all the SMS syntaxs you need on using eSewa over sms. eSewa is a most popular payment process used in Nepal also may be the first online payment system in Nepal. Using eSewa Via SMS and SMS Syntaxs are listed here. 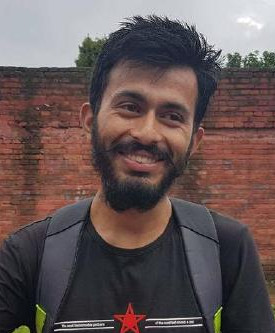 First lets us know more about eSewa. eSewa is the first online payment gateway of Nepal which was established in 2009 January. Being the first Online Payment gateway most people use eSewa next other payment process those exist in Nepal. They have linked up with as much as 15 banks in Nepal and also those banks provides exchange of moneys for free access so you might want to sign up and start using eSewa today. Airlines Tickets, Recharge cards, Electric bills and other receiving and paying process. If you are already verified members keep reading (However Verifyed account is not needed for Using eSewa over SMS.) else visit Create eSewa Account and Verify Nepal and create your account and verify your eSewa account. What if not verified there is limit on everything for unverified users. That is also included on that post. And the main thing about Verifying is that you can pick up fund received on Western Union. Now login to your account via Web and add your phone number to eSewa. Then go to My account then In Profile and then in More Details or just click https://esewa.com.np/main#!profile;tag=3. Now add your number there you may need to verify your number entering the verification code. Then you will get Mobile Personal Identification Number (MobilePIN). We will use MPIN in farther tutorials. Change MPIN <Current MPIN><space>CPIN><space><New MPIN> and send to 32121. By now you successfully added your mobile to eSewa and know some codes. 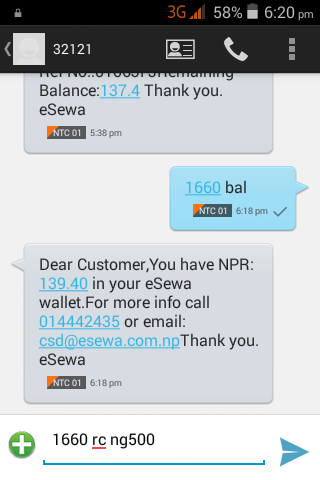 Check how I use eSewa via SMS, Here 1660 Is My pin and to Check Balance type 1660 bal and Send it to 32121. And bellow there is code for getting recharge card for NTC GSM of NRS 500. ** Remember you should be Verified mamber to send fund from eSewa to eSewa more the NRS 25. Any confusion Comment below. Using eSewa Via SMS and SMS Syntaxs Enjoy eSewa over Have good Days.